Cook and drain pasta as directed on package. Cool 5 minutes. Meanwhile, in 10-inch skillet, cook beef over medium heat, stirring occasionally, until no longer pink; drain. Stir in Worcestershire sauce and seasoned salt. Stir in Cheddar cheese. In small bowl, mix tomato sauce, ketchup and mustard. Spread in baking dish. 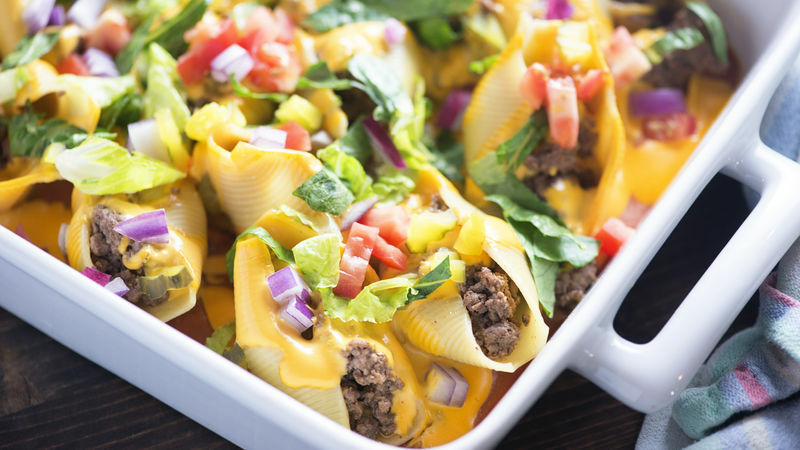 Use spoon to stuff beef mixture into shells; arrange in tomato sauce mixture in baking dish. Pour cheese sauce over all. Cover with foil; bake 20 minutes. Add some chopped fried bacon to the beef mixture to make this a bacon cheeseburger casserole! Add your favorite burger toppings!